My thoughts are all over the place. I started a blog post earlier today about Jane’s social life. I kind of meandered around into philosophical ponderings on the nature of being an “outsider” in a small town. I worked my way back toward the story I wanted to tell: her weekend of parties with new friends. On my way there, I stumbled over another point and thought, oh, yeah – that’s where I wanted to go with this. I didn’t see any easy way to transition to it and suddenly felt that the first 400 words were basically irrelevant. Or maybe another tale. So I started post #2, focusing on the new point as my starting point. But I soon found myself meandering again. It was becoming clear that I was not clear on what I wanted to write about. Then… then I get up from my computer. I go to the church to make copies. I come home and take a nap. I think about blogging about the Oklahoma City bombing anniversary instead. I decide that while I was there volunteering and I knew people who were in the building, it’s somehow shallow for me to write about it when so many other people were affected more. I go out to eat. I welcome my husband home. I try to collect my thoughts about Jane. 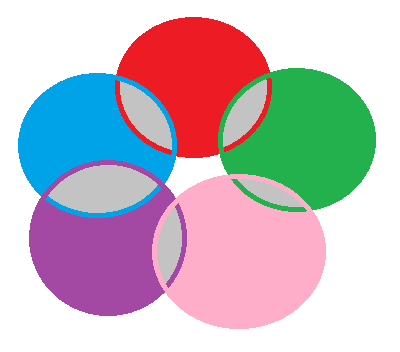 I decide to blog about Venn diagrams instead. And now here we are. So, yeah, you haven’t heard from me in over a week. This is partly why. I’ve mostly been too busy and then when I’ve tried, the stories haven’t come. I’ll just let you wonder based on the Venn diagram labels what’s going on in Jane’s world.